Astro City issue 52 continues the storyline of Mike, a man who created the Miranda’s Friends program as a means to help survivors of superhero trauma. Mike has kept his own trauma a secret, he has memories of two lives. One, a life of his former wife Miranda, and another life where Miranda does not exist. Due to the trauma caused by a superhero battle that caused a readjustment of time and space, Mike spends his days followed by the Hangman who offers Mike a solution: to continue living his life as is with memories intact of Miranda… Or to permanently erase all memories of her existence… what will Mike choose? And will his fellow friends believe his story? Kurt Busiek really knows how to write humanity in superhero stories. Especially when it’s more centered on individuals that are not superheroes, such as the character of mike. 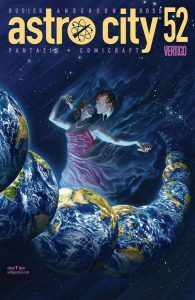 Busiek does a splendid job crafting a story that begs as much as questions as there are answers and much like real life, some questions lead to no answers, and some answers are never good enough for the questions that are asked. And that is something I personally have been struggling with when it comes to the loss of loved ones and trying to figure out how to reconcile and cope with the loss of people that you care about. It’s always refreshing to see Busiek write great stories that focus on everyday people that aren’t superheroes, that adds more depth to the world of Astro City. Anderson’s artwork, along with the inker and the colorists’ contributions really make this story shine. What’s great is the visual narratives and ques that doesn’t focus on bombastic, action, but on subtlety. The quiet moments of contemplation and reflection that are illustrated is what makes the book shine just as much as the narrative. Please do take chance and check this series out. 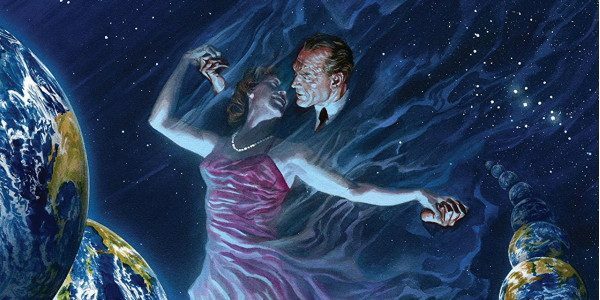 Whether you read it under Dark Horse, and currently have interest now that Astro City has been published under Vertigo/DC, It’s definitely a worthwhile read. It’s not the typical superhero comic because it’s focused more on everyday heroes, who don’t wear capes, but like just like your regular everyday man, woman, or child that you may see on the street, that aspire to want to do something good. This issue helped me cope with the death of my friend Kenny Mukendi (Kenny Vulcan) who passed away in April. At times we all wonder why things happen, but somehow the only thing one can do is try to find those answers within and try to make the most impact with the people that they interact with. That alone makes this series and this issue, worthwhile, at least for me that is.